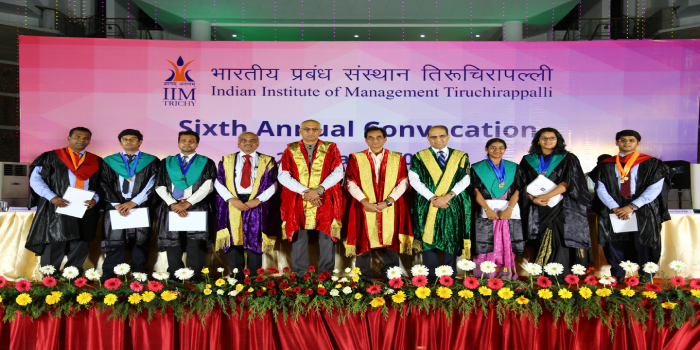 Indian Institute of Management Tiruchirappalli (IIM Trichy) held its Sixth Annual Convocation to on March 24, 2018 at the institute campus. Students of Post Graduate Diploma in Management (PGDM), Post Graduate Diploma in Business Management (PGDBM) were awarded Fellow of the Indian Institute of Management Tiruchirappalli. Shri. Jalaj Dani, Chairman, Board of Governors at IIM Tiruchirappalli awarded the diplomas to one graduate from the Fellow Programme in Management, 176 graduates of Postgraduate Programme in Management (PGP) and 18 graduates of the Post Graduate Programme in Business Management (PGPBM). Dr. K. P. Krishnan, IAS, Secretary, Ministry of Skill Development and Entrepreneurship, Government of India, was the Chief Guest and delivered the convocation address. Shri. CK Ranganathan, Chairman and Managing Director, CavinKare participated as the Guest of Honour in the celebrations along with students, families, faculty, alumni, staff and other visiting dignitaries. Dr. Bhimaraya Metri, Director, IIM Tiruchirappalli presented the Director’s Report. The Director wished the graduands with five mantras of success with the hope that they stand out in the corporate world. “Aim High; Set yourselves Himalayan Goals”, “Have Focus, i.e Laser Focus on your Goals”, “Keep learning and unlearning, he said while sharing pearls of wisdom with the audience. He ended his address by stressing on the Institute’s motto that reads ‘Gyanam Anantham’ which reminds students to be the first to adopt new ideas and technology and maintain high standards of integrity. The Chairman, BoG, IIM Trichy in his address welcomed the Chief Guest and Guest of Honour. He congratulated the graduating students and reminded them that IIM Trichy is their home and requested them to come back. 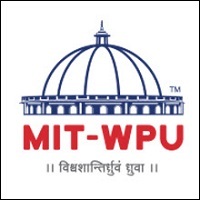 He complimented the government for conceptualising the framework for granting the autonomy to the IIMs. The Chief Guest, in his address, congratulated the students conferred with the management degrees. He stressed on the demand for new kinds of skills with technological advancements and that entrepreneurship has a huge role to play in it. The Guest of Honour, Shri CK Ranganathan stressed on the importance of EQ which consists of managing oneself and managing others in his address to the audience. He recommended self improvement books that helped him grow personally in his life and entrepreneurial ventures. Post awarding of the diplomas, there were several students who were honoured for their meritorious achievements and all-round performance. 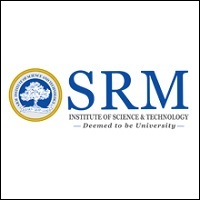 I have scored 50.26%ile in cat 2018 and I am a female student with ST reservation, will I be shortlisted in iim trichy? 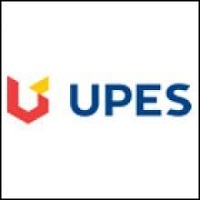 Hello, I want to do mba logistics and supply chain management course..is that course available? 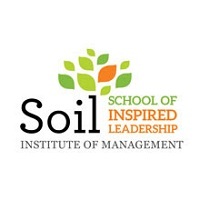 My son was shortlisted in IIM Lucknow (Sustainability management), IIM Shillong, Trichy & IIT Mumbai & Delhi. Which is best? Your Indian Institute of Management Tiruchirappalli brochure has been successfully mailed to your registered email id .